According to the US Geological Survey, a second earthquake measured at a magnitude of 5.8 struck Hawaii Friday, roughly 30 minutes after a 5.7 magnitude quake hit the island. Both quakes were centered very near the Kilauea volcano, which has been intermittently spewing ash and lava, threatening residential areas, since yesterday. Officials previously marked the earthquake at a magnitude of 6.9 before downgrading it to a 5.8. The latest shake, which happened at 12:32 p.m. local time, stuck some 11 miles southwest of the Leilani Estates, near Kilauea. The National Weather Service has stated that there is no tsunami threat at this time. However, it did indicate that "some areas may experience small sea level fluctuations." Since the quake struck, residents have taken to social media to share commentary and images of the surrounding areas. 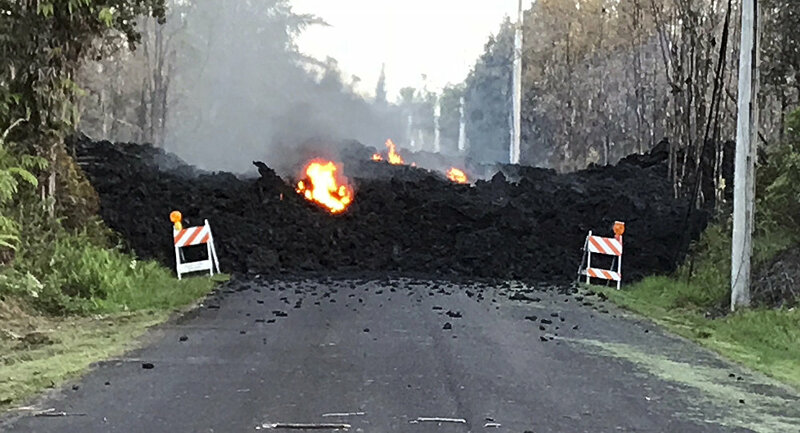 ​Prior to the earthquake, netizens reported seeing lava from Kilauea being shot up in the air in the Leilani Estates area, which is under mandatory evacuations after reports of lava streams and emissions were spotted coming from the ground. The area, which populated by some 1,700 residents, has seen more than 1,500 people fleeing from their homes, the Chicago Tribune reported. Officials monitoring the area have detected high levels of sulfur, threatening people with breathing difficulties and the elderly. There have been several tremors registered throughout the day, measured at magnitudes from 4.8 to 6.9. The latest quake first registered at a 6.0 before being upgraded to a 6.9, then downgraded to a 5.8. ​Authorities confirmed early Friday that at least two homes were "touched by the lava flow" after evacuations were initiated, according to a report from NBC News. Roughly 770 buildings are under threat as they are located near the volcano. If Sun Tans Are Bad for Coral Reefs, Could Hawaii's Ban on Sunscreens Catch On?